Nimbārkāchārya is the pioneer of the Nīmat branch of the Vaiṣṇava lineage. He was a famous scholarly and saintly person. He used to reside on the Dhruva Mountain near Vṛndāvan. After his disappearance, his disciples constructed a shrine for him at that place. This is a pilgrim place for Vaiṣṇavas. His father Jagannāth named him Bhāskarāchārya in his childhood. He was believed to be a partial manifestation of Sun god by people. He was an ardent devotee of Lord Śrī Kṛṣṇa. He was also known as Niyamānanda. Nimbārka appeared in the family lineage of Trailanga brāhmins who belong to a place called Mungerpaṭṭaṇ or Mungipaṭṭaṇ of Telangadeśa. His father’s name was Śrī Āruṇi Muni and mother Śrī Jayantī Devī.Śrī Nimbārka, the manifestation of the Sudarśan chakra of Śrī Viṣṇu, appeared in this world during the dusk on a full moon day in the month of Kārtik. According to some others, Nimbārkāchārya appeared on the third day of the waxing moon in the month of Vaiśākha. It is said that by the strength of his yogic powers, Nimbārkāchārya stopped the sunset climbing on a neem (margosa) tree, thus serving the guest sannyāsi before sundown, therefore becoming famously known as Nimbāditya or Nimbārka. (In Śukratal on the banks of Gangā) Many devarṣis (great sages among demigods), maharṣis (great sages), rājarṣis (saintly kings), and kāṇḍarṣis like Aruṇ Muni, etc had arrived. Seeing the assembled highly exalted sages, King Parīkṣit worshipped them as per the scriptural injunctions and prostrated on the ground. According to Nūtan Bāngla Abhidhān by Āśutoṣ Deb, Aruṇ5 is the elder brother of Garuḍa. His father is the great sage Kaśyap and his mother’s name is Vinatā. Kadru was the other wife of sage Kaśyap and the daughter of Dakṣa Prajāpati. She mothered one hundred snakes from one hundred eggs. The jealous Vinatā gave birth to two eggs and broke one of them in an immature state. From this egg, Aruṇ came forth without the thighs. He became the chariot driver of Sun god. His wife’s name is Śyenī. Sampāti and Jaṭāyu are his two sons. The exact time of Nimbārkāchārya’s appearance is unknown. At Jainath, there is a temple that is approximately six miles on the Southeastern side of the Ādilābād within Hyderabad province. Inscriptions were found on a stone there. From these inscriptions, it can be inferred that Śrī Nimbārkāchārya appeared before the 11th century AD. The inscriptions read oṁ namaḥ sūryāya. Worship Sun god, who fulfills the desires of all, with the sacred leaves and flowers of a neem tree on Sunday–even in an unusual (or forbidden) time, without fail. As per these inscriptions, it can be understood that there was a system of worshipping Sun god. In Bhaviṣya Purāṇa, it is written, nimbañca sūryadevasya vallabhaṁ tathā–the neem tree and its leaves and flowers are especially dear to the Sun. Hence the neem tree is worshiped as a symbol of Sun god. Nimbārkāchārya is the pioneer of the Nīmat branch of the Vaiṣṇava lineage. He was a famous scholarly and saintly person. He used to reside on the Dhruva Mountain near Vṛndāvan. After his disappearance, his disciples constructed a shrine for him at that place. This is a pilgrim place for Vaiṣṇavas. His father Jagannāth named him Bhāskarāchārya in his childhood. He was believed to be a partial manifestation of Sun god by people. He was an ardent devotee of Lord Śrī Kṛṣṇa. His another name was Niyamānanda. In order to preserve the honor of His devotee, Lord Nārāyaṇa appeared as Sun and fulfilled his prayers. In this regard there is a hearsay–one time a daṇḍī (renunciate) came to him. Seeing the sunset as they were discussing the scriptures, Nimbāditya brought some eatables in order to remove the fatigue of the guest. But that daṇḍī would not eat anything after the dusk. Therefore, he did not accept the hospitality of Nimbāditya. As a remedy, Nimbāditya obstructed the Sun from going down. Pleased by his prayers and devotion, the Sun god waited on the nearby neem tree until the guest finished his meals. Since then, he became famous as Nimbārka or Nimbāditya as the Sun god obeyed his command. According to Śrī Nimbārka, Brahman has attributes. The Brahmasūtra aphorism, athāto brahma jijñāsa ascertains Brahman as an object of knowledge and therefore to inquire about him. If Brahman were not an object of knowledge, such possibility of inquiring about him cannot exist. The form of Brahman is described by Śrīnivāsāchārya, the disciple of Śrī Nimbārkāchārya, in his commentary to Brahmasūtra, Vedānta Kaustubha. Nimbārkārchārya’s philosophy-bhedābhedavāda, is described as factual or intrinsic dualistic non-dualism. The commentary to Vedānta by Nimbārka is called Vedānta-pārijāta-saurabha. The oneness and difference eternally coexist, and in all states and at all times, the oneness and difference exist uniformly. Brahman is the cause; living entity, and world is the effect. Brahman is powerful; the living entity and the world are his two potencies. Brahman is a complete entity, whereas jīva and material world are within the Brahman and his minutest particles. The differences as cause and effect, as energetic and energy, and as complete entity and fragment are factual, innate, and eternal. Brahman is the object of meditation, knowledge, and attainment. Living entities are the meditators, knowledge seekers, and recipients. Brahman is the cause of creation, sustenance, and annihilation–he is all-pervasive and completely independent. Living entities are devoid of the power of creation, maintenance and annihilation; they are atomic and controlled. Both conditioned souls and liberated souls are different from Brahman. This natural and intrinsic difference between Brahman and a sentient being is eternal. Brahman is conscious, non-material, not gross, and eternally pure; whereas the world is devoid of consciousness, material, gross, and impure. Therefore, the constitutional difference between Brahman and the world exists eternally. Just as the differences between Brahman, living being and the world are eternal, the intrinsic similarity between them is also equally true and eternal. The cause is different from the effect by feature and activity, but similar by nature. The cause is different from the effect because the properties and activities of both are not the same. As for instance: a clay pot is different from clay because the pot has a shape and activity–to carry water, a purpose differing from that of the clay. But in spite of that, they are non-different because the clay pot is nothing but clay. Therefore, the effect is causal, potency of the cause, and rests in the cause. Hence the cause and effect are non-different. The doctrines of Nimbārkāchārya are therefore known as intrinsic oneness and difference. Śrī Śankarāchārya was a proponent of kevalādvaitavād, pure monism. He concluded that the absolute knowledge principle without variety, attributes, activities, and transformation is the nature of Brahman. Śrī Bhāskarāchārya was a proponent of temporary or figurative oneness and difference. He advocated the formless to be the cause of everything and he accepted its effect, the living entities and the world, to be real. Śrī Nimbārkāchārya was a proponent of factual or intrinsic oneness and difference. According to him, the Absolute Truth and Ultimate Reality is an infinite, inconceivable, colossal Principle possessing intrinsic transcendental potency. Śrī Bhāskarāchārya designated the Ultimate Reality to be Brahman unlike Śrī Nimbārkāchārya, who described the Supreme to be Kṛṣṇa and Puruṣottam and His internal potency to be Śrī Rādhikā. Śrī Bhāskarāchārya did not describe the beauty, sweetness, supremacy and transcendental Personality of Brahman. His ideology is not in line with the Vaiṣṇava philosophy that conceive transcendental divine qualities in Brahman. It is another form of Śrī Śankarāchārya’s undifferentiated monistic opinion. The famous vedānta-āchāryas of Śrī Nimbārka sampradāya (lineage) – Śrī Devāchārya and Śrī Sundarabhya refuted the doctrines of Śrī Bhāskarāchārya in their respective commentaries to Brahmasūṭras (brahma-sūtra-vṛtti). The well-known guru-parampara (spiritual lineage) of Śrī Nimbārkāchārya is: Śrī Haṁsa – Śrī Catuḥsan – Śrī Nārad – Śrī Nimbārkāchārya. Hence Nimbārka sampradāya is famous as Catuḥsan sampradāya or Haṁsa sampradāya. The conventional name is Nimāyet or Niyamānandi. Hear now Śrīnivās, about the Sanaka sampradāya. From Nārāyaṇa, Haṁsa incarnation appeared. His disciples were the four Kumāras headed by Sanaka. Their disciples and grand-disciples are innumerable. In this line Nimbāditya became a disciple, thus becoming the initiator of Nimbāditya sampradāya. The influence of Nimbāditya is supremely wonderful. His disciples and grand-disciples filled the world. The influence of Śrī, Brahma, Rudra and Sanaka lineages expanded further into many branches. Knowing that Kaliyuga would be dark, the merciful Lord decided to preach devotion. 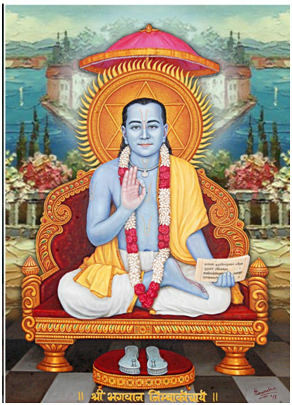 He empowered four devotees and sent them to preach devotion throughout the world. Śrī Rāmānujāchārya, Śrī Madhvāchārya, and Śrī Viṣṇu Swāmī are three of them. You are the fourth of these great devotees. Lakṣmī Devī accepted Rāmānujāchārya, Brahmā accepted Madhvāchārya, and Lord Śiva accepted Viṣṇu Swāmī. Today, we have accepted you as our own. We will make you our disciple and thus become fortunate. This is our purpose. Previously, we were absorbed in the meditation of non-duality, but by the grace of the Lord we got rescued from such sin. We now understand that pure devotion is extremely relishable and we have written a scripture with the name Sanat-Kumāra-Saṁhitā about it. You will certainly be initiated in to its teachings.” Seeing the grace of his guru, the wise Nimbārka came immediately after taking bath in Ganga. In various Purāṇas, different names of Śrī Nimbārka can be seen, viz. – 1) Āruṇi, (son of Aruṇa) 2) Jayanteya, (son of Jayanti) 3) Haridās Haripriya, (the one dear to Śrī Hari) 4) Sudarśan, (incarnation of Śrī Sudarśan discus) 5) Havirdhān, (maintainer and protector of sacrificial items of yajña) 6) Niyamānanda,, (one who is devoted and blissful in the execution of religious prescripts) However, he became famous as Niyamānanda or Nimbārka. In the section Naimiśa-khaṇḍa of Śrī Skanda Purāṇa, his name is mentioned as Havirdhān. Nimbārkāchārya appeared in Andhra Pradesh in South India during the era of Ālwar devotees. Due to the predominance of Buddhism and Jainism in North India during that time, devotional practices were not prevalent there. However, owing to the influence of Ālwars the devotional practices were significantly spread in South India. Therefore, Nimbārkāchārya came to North India to propagate the path of devotion. The South Indian Ālwars were worshippers of Śrī Kṛṣṇa with a particular inclination towards service in the conjugal mood. The principle limbs of worship according to Śrī Nimbārka are – devotion, surrender, and complete self-dedication. In his self-composed ten verses, Śrī Nimbārkāchārya mentioned about the contemplating on the worship of the Divine Couple, about Śrī Radhā being served by thousands of Her female consorts, (sakhīs) about the characteristics of the topmost loving devotion, and about the glory and importance of Lord’s mercy. Śrī Nimbārkāchārya came to North India from South and stayed in Nimbagrām near Govardhan in Brajamaṇḍal by constructing an āśram (a place of residence for sādhus). There he was engaged in severe austerities such as drinking only the juice of the neem fruit. He traveled to several places and to several pilgrim places like Kurukṣetra, Naimiṣāraṇya, Puṣkar, Dwārka and so on propagating Bhāgavat dharma. Śrīnivās was the most prominent among the disciples of Śrī Nimbārkāchārya and became a successor for the post of ācārya after him. Dr. Amar Prasād Bhaṭṭāchārya ascertained the Nimbārka sampradāya to be the ancient among other Vaiṣṇava lineages. Śrī Nimbārkāchārya wrote a commentary to the Brahmasūtra of Śrī Vedavyāsa by the name Vedānta-pārijāta-saurabha. In his writings, he neither refuted other’s opinions nor mentioned the names of other ācārya’s conceptions including: advaitavāda (monism), dvaitavāda (dualism), viśiṣṭādvaitavāda (non-duality with particular attributes) and śuddhādvaitavāda (pure duality). He simply had written commentaries to Brahmasūtra, thereby substantiating his own conception of dvaitādvaitavāda (dualistic non-dualism). Therefore, it can be proven that this commentary was written before the other conceptions or opinions have originated. The author of Bhāratvarṣīya Upāsak Sampradāya, Śrī Akṣay Kumār Datta Mahoday, mentioned a Nimbārka sampradāya by the name Nimāt. He also wrote that the neck beads and chanting beads of this sampradāya are both made from Śrī Tulsi tree. Their object of worship is the Divine Couple, Śrī Rādha Kṛṣṇa, and their principle scripture is Śrīmad Bhāgavatam. They say that Nimbāditya has written a commentary to Veda. Currently there are no scriptures available of this sampradāya as they had disappeared from Mathura during Mughal Empire. From the two disciples of Nimbāditya: Keśav Bhaṭṭa and Harivyās,two branches originated– virakt (detached) and gṛhasta, (householder). Nimbārka’s divine shrine is in Dhruva Kṣetra on the banks of river Yamuna in the vicinity of Mathura. Some say that this place is being taken care by the descendants of Harivyāsa. But the head of the monastery calls himself as a descendent of Nimbārkāchārya’s family. He claims that the shrine in Dhruva Kṣetra was established more than 1400 years ago. The Nimāt devotees reside at many places in North India. 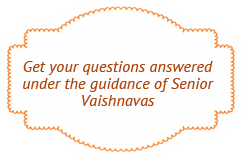 There is a vast presence of these devotees particularly in Mathura and its surroundings. “Nimbārka, also called Nimbāditya or Niyamānanda was a Telugu speaking brahmin, yogi, philosopher, and prominent astronomer who founded the devotional sect Nimbārkas, Nimandi or Nimavats who worshipped the Deity Krishna and His consort Rādha. Nimbārka has been identified with Bhāskara, the 9th or 10th century philosopher and celebrated commentator on Brahmasūtra (Vedānta sūtra). Most historians of Hindu mysticism, however, hold that Nimbārka probably lived in the 12th or 13th century because of the similarities between his philosophical and devotional attitudes with those of Rāmānuja traditionally dated 1017-1137. Both, adhered to dvaitādvaiata, (dualistic non-dualism) the belief that the creator god and the souls he created were distinct but shared in the same substance. Both stressed devotion to Kṛiṣhṇa as a means of liberation from the cycle of rebirth. Article from Srila Gurudev’s book, ‘Puranic Charitavali’, originally written in Bengali language (English Translation by Prahlad Das).